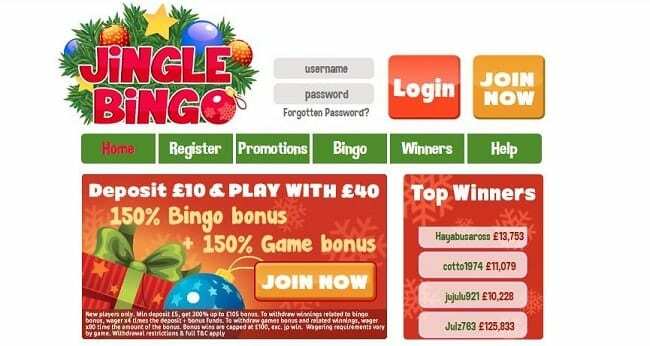 Jingle Bingo is a fun-filled site where gaming and Yuletide team up to bring holiday cheer and cash winnings in the UK! There is a wide variety of selections to choose from for beginners and experts alike, such as 75 and 90 ball bingo, scratch cards and virtual slot machines. I was amazed by the different options for depositing, such as PayPal and Neteller, and fell in love with the holiday charm that this website had to offer. Carry on reading the rest of our Jingle Bingo review to see all of the top features and offers available on this site. We have looked at all of the different activities and everything the site provides to bring you an in-depth overview. When you first join this site, the Jingle Bingo bonus codes for April 2019 enable you to get a 300% welcome offer. With your first deposit of £10 you’ll get an extra £30 free, giving you £40 in total to play with. This comprises of a 150% Bingo Bonus for a first-time deposit bonus, and an additional 150% bonus for Games (minimum £5 first deposit with a maximum Bonus fund of £52.50 for each type of Bonus). Unfortunately, there aren’t any no deposit bingo sign up offers with this site so you can’t try the games for free first. An initial deposit will mean an instant bonus to get you started on the website. On Sundays to Thursdays at 2100 GMT, the Spin-Tastic Promotion nets Full House winners an additional 100 Free Spins, 2L winners 50 Free Spins, and 1L winners 20 Free Spins. There are “Sure Win” monthly promotions held on 1st and 15th of the month, where a £2500 jackpot is split based on the number of paid tickets amongst non-winners. There is also the monthly big £10k which guarantees every player a share of the £10,000 jackpot, with prizes up to £750 for getting a full house. This is a great opportunity to take a piece of the winnings. The Jingle Bingo games are run by Cassava Enterprises Limited, a subsidiary of 888 Holdings who specialise in fun online games. Launched in December of 2015, this website came out just in time for the Holiday season. They have different types of games, including 30-ball, 75-ball and 90 ball, but what I love most about them are their different slots and scratch card games. The 75-ball game has a variety of patterns and different progressive prize packages, while the 90-ball game comes with the three standard ways to win, such as first to completing row one, first to completing rows one and two, and the first to complete a full house or full card. The holiday based slots such as “I Love Christmas” and “Sugar Train Christmas” bring back nostalgia of presents under the tree and gingerbread men. The chat system is very good as well, as the hosts are cordial, friendly and responsive. This particular site is developed and run by Dragonfish, who have developed options for Desktop and Mobile. The Desktop option and Mobile option are both Instant play, meaning you don’t have to wait to see a wager placed! I’ve played a few games and the website runs smoothly each time allowing you to make use of the Jingle Bingo bonus codes and other offers. They also have email and toll-free phone chat support options, and the operators on the site are friendly and responsive. One thing I really liked about Jingle Bingo is that the mobile platform allows for gaming on the go. The games work on both mobile and tablets such as iPhone and Android tablets, so smartphone users can get in on the games! Some of the slot games work too on the mobile bingo platform, but the mobile options are better geared for Bingo. You can access the Jingle Bingo mobile site using the internet browser on your smartphone or tablet. This enables you to use all of the different features and promotions on the site without having to sit down at a desktop computer or with a laptop. You can get a more diverse gaming experience by logging in wherever you go to make sure you don’t miss out on winning a jackpot. You will find a variety of payment options such as PayPal, Visa, Mastercard, Neteller, Entropay bingo deposits, Paysafe. This is a good selection of secure transaction methods to make players confident in making deposits and transferring their money online. It also makes it easy to sign up and claim your promo codes and bonus offers using your login. For withdrawals, minimum withdrawal is £20 and it took 5 days to receive my winnings, which is a little longer than I desired. When I attempted my first withdrawal I was asked for photo identification, proof of address and copy of my credit card. I was fine with this as I wanted to make sure that everything was securely processed. Withdrawal times vary based on how you deposited; I deposited using Paypal, and it took the promised 4-5 days to get my winnings. With other options, such as credit card or bank cheque, it can take somewhere between 4-8 days in the UK, longer if you play outside of the UK. After completing this Jingle Bingo review April 2019 we would definitely recommend it if you are looking for a themed site with a good selection of games and promo offers. The sign-up bonus of £30 free when you deposit £10 is very generous and enables you to make the most of trying out different features and activities. One issue is the lack of no deposit bonus when you first join, so there is no way to try the site for free before making a deposit. However, some players probably won’t mind this if they want to use the website anyway. Be sure to sign up now and see for yourself if you are interested in playing the games on offer!